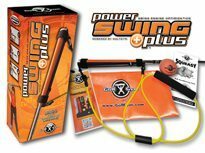 We have all heard about the importance of performing a "One Piece Takeaway" in order to generate a wider swing and to engage your upper body in the separation and kinetic sequencing that engages the kanutin valve which helps with gas mileage. WHAT!!! But seriously, a one piece takeaway is very important to your overall swing performance. 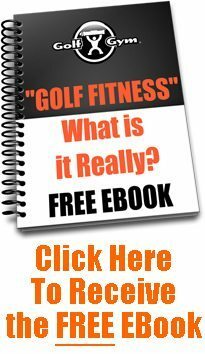 Tiger Woods, Brandt Snedeker and every other professional golfer performs a one piece takeaway in their golf swing. Pre the modern era a third start , the lag load was also a possibility . Today as I teach the average player I'm always trying to make this already difficult game easier for anyone that wanders into my lesson tee. All this being side , the takeaway I lean toward the most with Mr. and Mrs. average player is the one piece start. Very simply I tell my students if we start the major components (hands , arms and torso) of the backswing away together it stands to reason we are much more likely to return them together . Picture a line drawn across your shoulders and then down each arm finishing at the grip. Basically we are describing a triangle . Your job once the triangle is formed is to get that triangle started in a dead heat ! Work on your one piece takeaway and you'll be amazed at how much easier contact becomes ! Keep me posted . These simple drills on the video below will help to prevent your hands and/or arms from taking over in the initiation of the swing. 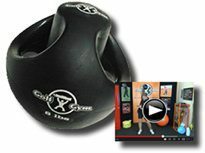 It will engage the upper body more which in turn develops more stability in the lower body. 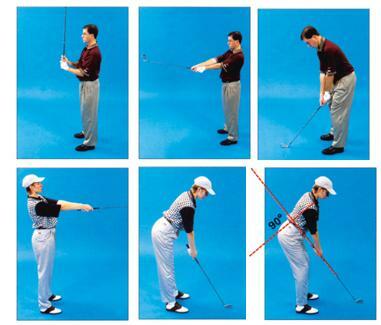 Starting with just hands or arms will create a flimsy and loosey goosey swing. Make sense? In this video, I will demonstrate the loosey goosey takeaway along with the one piece takeaway, and show you two really easy drills that you can perform every day that will help you to "FEEL" the engagement of your core in the takeaway. Yes, that seems simple enough, but I want you to try it. If you are performing the drill correctly, you will feel what I am talking about. An added benefit is that by engaging your abdominal muscles in this drill, you will help your lower back as well. Try these drills and leave us a comment below. * Check out his New Online Academy on his website!! I've mentioned previously that several months ago I joined a gym called Planet Fitness. 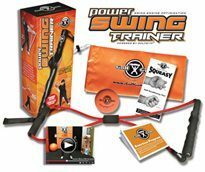 I go there every morning and get a great workout using some free weights, the pull down machine, my PowerSwing Trainer and the GolfGym PowerBandz. Because I spend my first 15 - 30 minutes warming on the treadmill at the far end of the gym, I get a good look at all the activity in front of me and all the people as they walk by or workout. An older man who loves to use the third treadmill from the wall has a great attitude and shows up every morning to get in his workout. I bring him up because his posture is so bad that it pains me to see him walk around. It may be because of a disease, but his head hangs out over his chest. He basically faces down most of the time and has to turn his body to look up. He is of course an extreme case of poor posture, but as I look at more of the folks there at the gym, and everywhere I go, I'm finding that poor posture is rampant in our society. 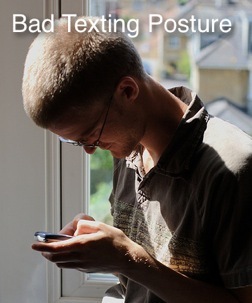 I think we can blame the incredible amount of texting and the use of smart phones and hand held games by the younger of us for their poor posture There is a great article on the new phenomenon called "Text Neck"
I find myself checking my posture many times throughout the day. I sit on a Balance Ball for a period of time while at my desk (I'm working up to more and more hours on the ball). It makes me more aware of my forward lean trying to get closer to the computer monitor, and I feel like I am in a continual correction mode. For those of us that have to sit at a desk for some time during the day, and do a lot of work on a computer, it is very easy to fall into a really poor posture that over time becomes a habit. When you are sitting, standing or walking, try pulling your shoulders down and back and hold for 6 - 10 seconds. Check yourself in the mirror from the side to see if your ears are aligned over your shoulders. You will be amazed at the people who sport a rounded back with their ears well over their chest. OK...what does this have to do with my golf game? Given that we rotate around our spine in the golf swing, poor posture is a definite disadvantage when it comes to golf performance. 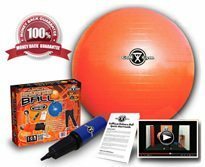 There are many exercises that will help you with your posture using a Balance Ball, PowerBandz, pull down machines, etc. We will be adding many of them including video to our Facebook Page over the next few weeks. We would really appreciate it if you would Like Us there. 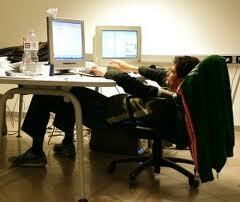 For now...work on becoming aware of your posture and check yourself many times throughout your day. Pull your shoulders back, walk tall and concentrate on how a good posture feels. Try to duplicate that feeling several times throughout every day. Make good posture a habit. Good Luck with your Posture!